Ok. We have talked about this A LOT. I am sorry that I keep harping on this same issue, but this has to be said. DO NOT TRY TO PASS YOUR PET OFF AS A SERVICE ANIMAL. Honestly, I am so irritated that I even have to state this again, but it just won’t stop happening. Try googling “fake service dog” and see how many hits you get. Go ahead, I’ll wait. One of Casper’s cousins had a run in with this recently and just yesterday we were approached by someone saying how they wished they could take their dog everywhere. We were at church and this person (since we see them all the time and some of our friends at church read this I will not go into too much detail and give the person away) said that he/she would like to take their dog everywhere, especially hotels. We nodded, knowing that many people have this wish and hearing it often. This is not a strange desire. We would hate to leave our pet at home, especially for long trips. Yet this person went on to pat Casper’s vest and ask where to get one. I was now skeptical, but said we ordered it online. Then there was more talk and I explained that if the dog provided a real service this person should check into getting it certified. All this time we are smiling and trying to be polite. We do our best to be kind even when we are starting to get a little exasperated. Finally I clearly stated that this person should be aware that trying to pass your pet off as a service animal IS ILLEGAL. So, people need to really think about this before they do something stupid. Let’s say you get off easy and are hit with a fine. This could be a very large fine. Maybe so large that you have to start picking up some odd jobs to make ends meet. One of these odd jobs is helping some old guy from Craigslist clean out his basement. You show up to find that the old man is Adam West and he has built a perfect replica of the Batcave from his Batman television series. He puts you to work cleaning. While you are cleaning the McDonald’s wrappers out of the inside of the Batmobile he jumps in and announces he needs help because The Penguin has an evil plot afoot. Before you can jump out he has taken off at full speed, trapping you in the vehicle. Before you know it you are at an aquarium and Mr. West is fighting with the penguins. You try to stop him, but the penguins get mean and you have to try wrestling them off of yourself. The police show up and you are arrested for breaking and entering, assault, animal cruelty and a number of other crimes. You may not have gotten jail time for you fake service dog scheme, but it came around after all. Don’t wrestle penguins with Adam West. Don’t pretend your pet is a service animal. Karma is a female dog, folks. Now, for those of you who know all about service animals I apologize about the post. I feel compelled, however, to post this today because of some comments I received on our two most recent blog posts. In an effort of fairness I have approved those comments and you can read them. I do not make comments go through moderation so that I can edit people or pick and chose what goes on the blog. I only do it so that spam links, foul language, and threatening posts do not go on the page. One of these comments claimed that we are not educating people with this blog as we have set out to do. They accuse us of using it to vent about bad experiences we have had. Those of you who know us or have been reading this since the beginning know better, I hope. We went to eat after leaving SDP on Sunday. There was an outdoor area and a family was eating there with another dog. It was gorgeous out so we would have loved to stay outside, but we didn’t want to have to worry about Casper getting distracted. The hostess, who was outside the door, didn’t even ask if we wanted inside or outside and pointed to a table immediately next to the other dog. We explained that Casper was working so we needed to go inside, away from the other dog. She asked us to wait outside and went in to get a waitress. A waitress came out and said that he couldn’t come inside. I explained that he was a service dog and handed her a card with the law on it (we were ready this time). Again, they went inside and made us wait outside. Finally, we were admitted and people were very kind. We are not upset with this establishment because there was no malice. No one insulted Casper. They were just uneducated. We did speak to the manager who reassured us that he knows the law and that they should have known it too. We told him we did not wish for anyone to get in trouble, but they needed training. Ok, that said I will move on to the purpose of this blog. We have a business card in Casper’s vest that we can hand out, if needed, that sums up the ADA law in reference to service animals. It does not go into deep detail, but it gives the basics. 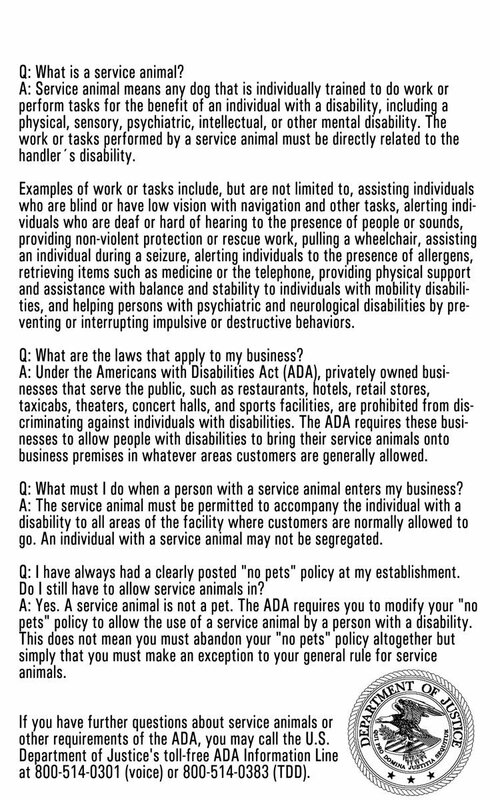 For anyone wanting to read more, you can go to the ADA website and view the most recent (2011) revision of laws pertaining to service animals. I won’t get into every word on the card, but let’s talk about the front side, which is the basic summary of our rights and also includes a toll-free number for the establishment to call. The back has FAQs for the establishment and I won’t go into those right now for brevity’s sake. In bold, the card states, “I am a Service Animal and my right to accompany my handler is protected by Federal Law.” Now, if it were me, and for 36 years of my life I was without a partner who had a service dog and I also worked in restaurants and retail for most of my adult life, that statement alone would be enough. Actually, I knew the laws from the early days of employment because it was covered in training as it should be in ALL public establishments. That is not enough for everyone, however. Restaurants will especially think that they do not have to comply because of health regulations. Therefore, the card goes on. Business may ask: 1) Is this a Service Dog? That is ALL you are allowed to ask. And the same goes for employers of someone who has a service animal. You cannot ask, “What is your disability?” or “Why do you need a dog?” Not only are these questions rude, they are illegal. When we are asked we tell people that Casper is a mobility dog. If they don’t understand that (because we talk to kids a lot about what he does) we will say he helps Dan with his balance, walking on stairs, or getting up and down if he falls or even bracing to get up from a seated position. They do not need to know anymore than that. 1) Require special identification for the animal. Now, I understand why some people do not agree with #1. There are plenty of people who bring in fake service animals. However, we should not bear the burden of proof that our animal has been certified. There are rules about how the animal should act (getting to that next) and that is all we need to fulfill. Can you imagine if you had to carry your child’s birth certificate (or your own) with you wherever you go? I don’t even carry my social security card with me. It is not safe. And it is a hassle. If you think going everywhere with an animal is easy, it’s not. It is like going everywhere with a small child (except often the animal may behave better). We do not get to just “run in” anywhere quickly anymore. We have to make sure we have bags, leashes, bowls, and sometimes his food, wherever we go. We have to stop in the middle of things to walk him. It is not easy. The last thing we need to add to it is keeping track of important paperwork every day. We just covered #2. Don’t do it. Number 3 applies mostly to hotels. The dog is not there by choice, it is by necessity. We are responsible for any damages he might cause anywhere, but no upfront fees can be charged. It also applies to rental property pet deposit. Rentals that do not allow pets are also required to allow service animals. 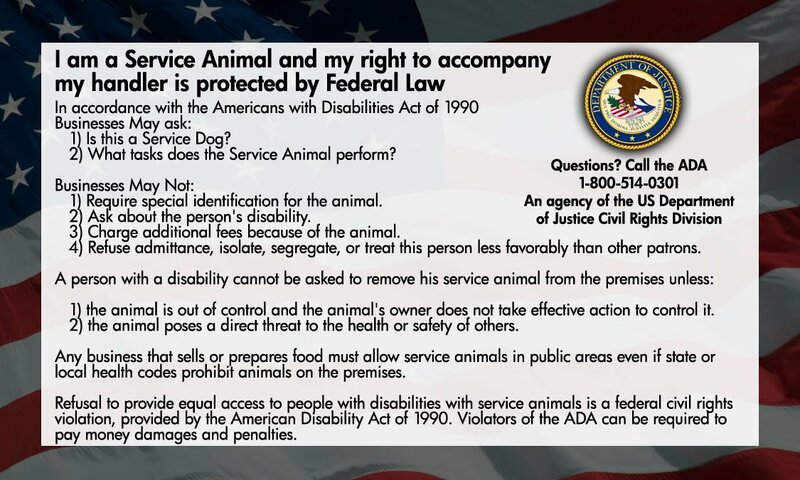 “A person with a disability cannot be asked to remove his service animal from the premises unless: 1) the animal is out of control and the animal’s owner does not take effective action to control it. This is the part where we, as service dog handlers, are responsible. During our recent “incident,” if Casper HAD been the one in the store barking and growling, or if he was acting wild and knocking thinks down, then the shop owner would have every right to make him leave IF (and this is the important part) we did take not immediate action and successfully get him under control. We have had issues outside where Casper would pull and bark a greeting at another dog (his bark is LOUD) and that would be unacceptable in a shop. However, a quick tug at his correction collar and a “leave it” would stop that behavior and have him back in control and we would be fine. Of course, on Saturday, Casper did not bark, tugged only slightly toward the dog (after it barked) and was immediately in a down-stay before he was even reprimanded by the shop employee. In other words, he was legally allowed to be there. Also, an establishment may not refuse to offer goods and services once the service animal has been removed as requested. As to the second part, any service animal that bites, scratches, knocks someone over, etc.. can be removed. A service animal cannot be removed if someone is allergic or has a fear of animals. Reasonable accommodation for both parties will be made by the establishment. I worked for an airline for a time and the rule on a plane is that the service animal has priority and someone with an allergy must be rebooked on a different flight. In other words, they can be sued. Now, we believe that the American culture has become sue happy. We don’t want to ruin anyone because they did not know that law. However, we don’t think that people can be allowed to treat those with disabilities like second class citizens. Civil rights are quite important to us and if a company continues to refuse access to us, or someone else, they may face legal action. We did not want to do this in the case of Mystical Elements because it came down to an issue of ignorance and fear. We feel that we educated that store and staff and are certain it will not happen to anyone in the future. I hope this EDUCATED our readers better than we have done as yet. And stay tuned for a fun post tomorrow. Casper was a little naughty at home this weekend!! Don't miss a post. Provide your email and you will get a notification when we post on this blog! Thanks! Cheers! Merci! Gracias! Danke! Grazie! Domo! Asante! Is that a Service Dog?